If you have been following this, you’d know I haven’t posted in one week, that’s because I went to Bangkok for my good friend’s bachelorette party. And if you are reading this closely, you’d know that I’m dating someone. Let’s call him Fat Cheeks. What happens in Bangkok stays in Bangkok – but the bachelorette party continues! right up till the wedding (and maybe after). So we went out for dinner but just before dinner, Fat Cheeks called me to call the whole thing off. In my entire year of dating, he’s the only one I really really really like; I like him so much I would give up the green stuff occupying 30% of the globe for him. He made me feel like I’m in a teenage dream. Ah, too bad, so I don’t deny that this review is affected by my emo mood. There were six of us. Inadvertently, Huccalyly and I always order the same dish: Linguine ai frutti de mare, or if you cannot read Italian, it’s linguine in the fruits of the ocean. It is usually served in a tomato based sauce but since we live in sin, we changed it to cream. I changed my pasta to fusilli, the one shaped like a corkscrew. It’s my favorite pasta because it’s tiny and therefore won’t cause splashes on clothes; and it has a large surface area which means it absorbs much of the sauce. The scientific education in Singapore has helped my food review! My sister ordered Pappardelle al ragu d’anitra con funghi or pasta with duck and mushroom. Has anyone wondered why Italian restaurants in Singapore like to be call their dishes in Italian names, knowing that no one can pronounce it? My kind sis (probably in a good mood) gave it a 4/5; she said the taste of duck had soaked into the pasta, flavoring it. 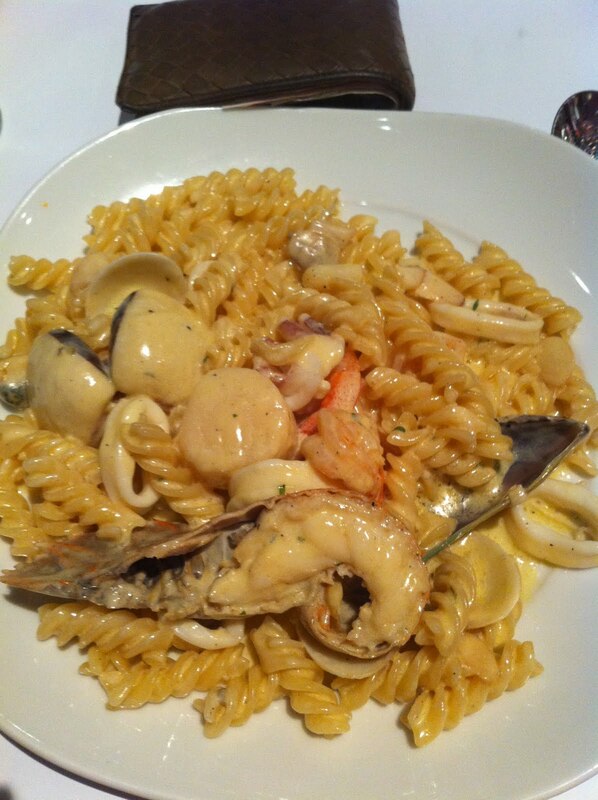 But when I tasted it, I thought the ribbon-pasta was a little too tough and the dish too salty. No more Italian names ok? 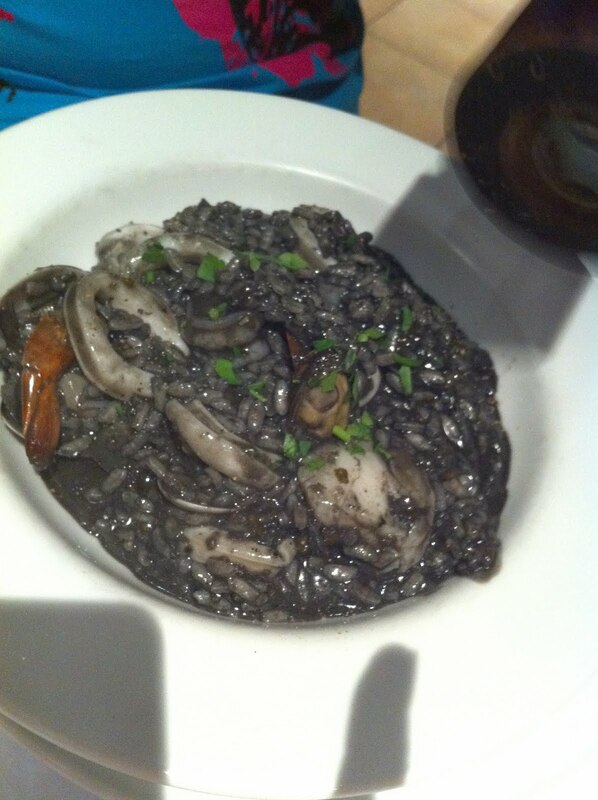 Dora ordered Squid Ink Risotto. I have a running joke with squid ink because I almost always order squid ink pasta everywhere I go since I NEVER had a good one, so I keep ordering. Luckily, Dora is my guinea pig. She gave it 3.5/5. I only ate a morsel but didn’t think much of it, not much different from eating rice. Chantel ordered a safe bet, carbonara. What can go wrong with it, right? She gave it a 3.25/5, claiming that the bacon wasn’t infused with the pasta, and it was too oily. Lastly, Sak-It ordered the Special of the Day, which I forgot what. I think it’s beef stew with carrots pasta. I thought it was olive-oil based but Sak-it corrected me: white wine-based. Sak-it and I thought it was overly salted, giving it a rating of 2.75/5. To maintain our hour-glass figures, six of us shared two desserts, opting for the boring tiramisu and panna cotta. 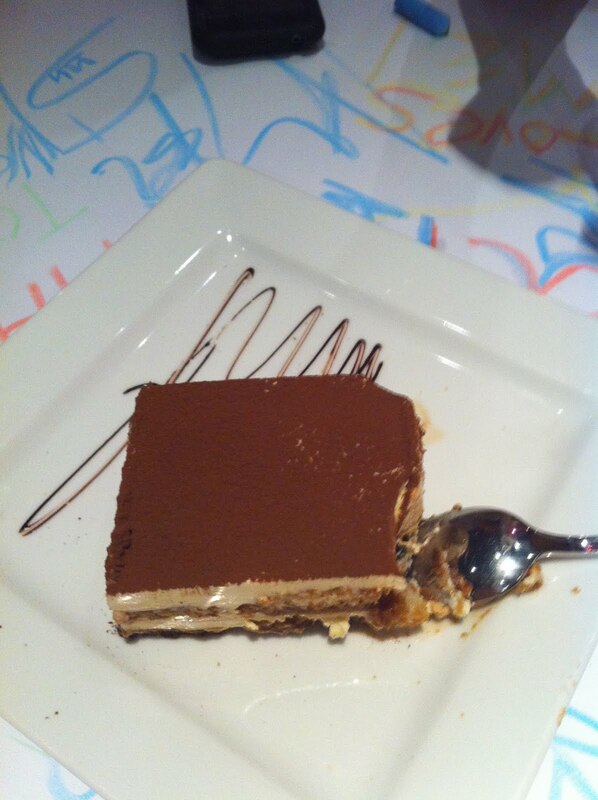 The panna cotta wasn’t impressive, very normal, but I really like the tiramisu. My sister thought it was too rich but I like the moisture of liquor (I couldn’t tell what it is, but it’s very slightly sweet) and the sweetness of the liquor is offset by the bitterness of real coffee. This may top Da Paolo’s tiramisu. Overall, the food isn’t great, but everything else is.